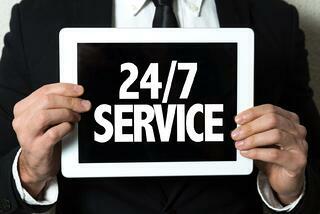 It is vital to any business having live agents ready to assist customers at any given moment of the day or week. Revenue is lost when sales are not generated after hours due to a lack of liv e representation when needed. Just because businesses follow a 9-to-5 workday, does not mean customers only make orders from 9-to-5. The importance of having 24/7 agents at the ready with customer orders or inquiries makes the online order process smoother, therefore raising customer satisfaction significantly. Imagine walking into your favorite 24-hour super store- how happy are you when there is almost no one on staff to answer your questions, and only 2 registers open? Preventing backorders will significantly affect the order processing experience. One way to effectively prevent backorders from occurring is by having live agents 24 hours a day, 7 days a week, and giving them access to inventory levels. When the agents know exactly what is in stock and what is not in stock, they can sell more efficiently. Agents can upsell and cross sell the customers more accordingly when having access to the inventory. Order processing systems help ensure that all of your customers' orders are filled accurately and in a timely manner. Customers will leave and seek out your competitors when these elements are fumbled. Partnering with third party call center is one way to efficiently staff a second and third shift for live agent response, access to live inventory levels, and to help increase the average order value of a customer’s order. The most important asset to any business is its customers. Customer satisfaction is key to long-term success, and fulfilling customer orders dependably and accurately, is paramount to a satisfactory customer experience. Nothing is more agonizing to a customer when they are trying to reach a live agent in customer service and there is no one available, or the hold time is so long they give up waiting and abandon the phone call. Customer satisfaction measures how products or services supplied by a company meet or surpass a customer's expectations. Customers will be happier when there is an agent available to assist them in placing orders, tracking orders, product questions and overall general inquiries. Not having an agent available for a customer at any given moment when a customer is in need of assistance may leave customers with a bad impression of your business- leaving them thinking they aren’t worth having an agent of your company available to help them buy your products. Heighten customer satisfaction by employing agents around-the-clock ready to assist. Why treat your ecommerce customers any differently from your live shoppers at the store? The opportunity to serve your customers around the clock with knowledgeable, cost-effective agents is available and can dramatically impact the impression your company leaves on your customers. Download our Free E-book on how to drive sales with great customer service and customer experience management today!